Aug. 23, 2018, 8:30 a.m.
An academic read through a bunch of smart people’s thoughts on the near-term future for news. Here are the trends he found. By Joshua Benton @jbenton Aug. 23, 2018, 8:30 a.m.
At Nieman Lab, we’re usually the studiers. But here’s a case where we’re the studied. Or, more precisely, where the 176 (phew) contributions to our Predictions for Journalism 2018 package are the studied. Every December, we ask a lot of smart people — journalists, technologists, academics, designers, strategists, and more — what they think 2018 will bring for our ever-disrupted industry. Their predictions — which, let’s be honest, are often closer to “wishes” or “complaints” or “concerns” than predictions — cover a range of issues, and while the people I pick are hardly a scientific sample, in toto they can be taken as a rough representation of what our field is thinking about at that snapshot in time. This year, Juho Ruotsalainen, a PhD student at the Finland Futures Research Centre, decided to interrogate that snapshot by offering “an analytical framework for the anticipation of the futures of journalism by mapping out how experts see the current state and the future of journalism.” His findings have been published in the journal Futures. Although nominally the predictions are about the next year, many experts explicitly write about the (near) future. However, as the focus is on the next year, the predictions are rather concrete, plausible, and timely. They have a good balance of facts-based arguments and more imaginary approaches, employing both explicit and tacit futures knowledge. Compared with similar report, the Nieman Lab predictions are arguably more diverse and qualitatively more rich — the experts can express their view on the future of journalism freely, without any predefined questions — less technology-centered, and not as strictly covering the next year only. 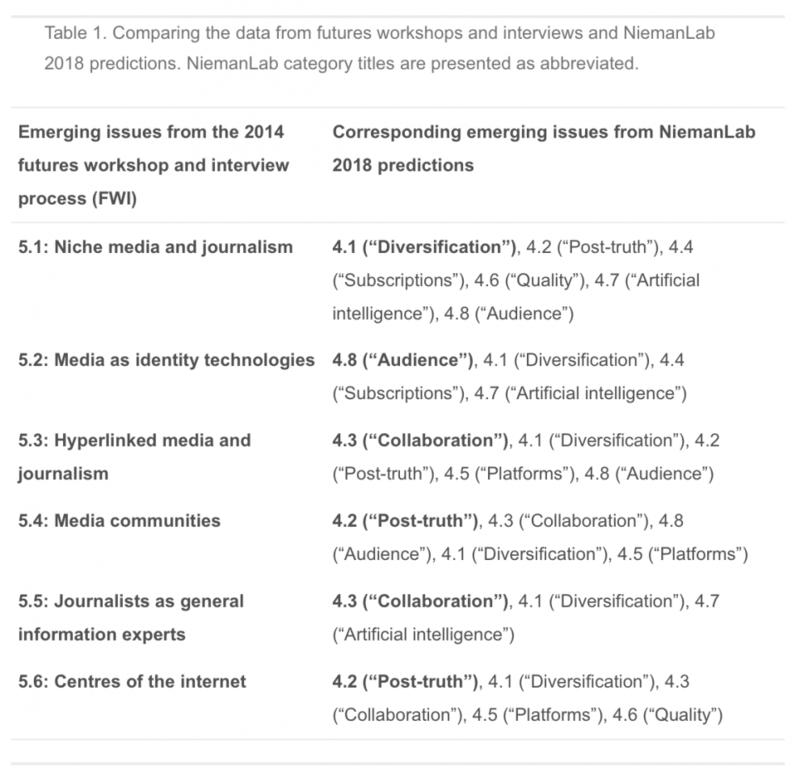 On the other hand the Nieman Lab predictions lack in structure and focus as they are not categorised. What this paper provides, in part, is elevating the “raw data” of the Nieman Lab predictions by categorising them into groups, revealing hidden patterns and similarities within the data. First, I’d like to welcome Juho to the extremely small society of People Who Have Read All 174 Predictions for Journalism 2018. The monthly meetings were getting boring solo. But I’ll also express general agreement with his categorization. One quibble would be that he treats “diversification of journalism” primarily as concerning diversification of formats, distribution platforms, and algorithmic presentation — whereas an awful lot of those predictions were about primarily about diversification in the classic race/gender/class American Studies sense. dialogical journalism: no strict division remains between producers and consumers of news content, and journalism professionally amplifies the conversation of society and its citizens (public connectivity, open journalistic culture). …show a shift away from centralised, unidirectional mass media to more diverse, specialised, subscriptions-funded, networked, collaborative, communal and at least to some extent platform-driven media. Journalists’ job descriptions are becoming blurred with other occupations. The networked and diversified nature of the emerging media ecology implies that different, often conflicting, views abound. This will presumably help the condition recently labelled “post-truth” persist. As a countertrend, well-known brands solidify their status, and many focus to offer non-tailored information of general interest. 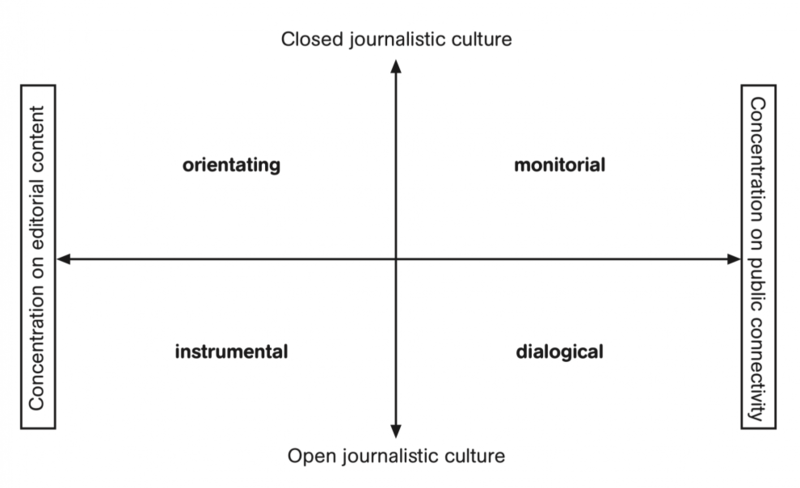 In terms of journalism types, especially dialogical and instrumental journalism can be anticipated to proliferate. Dialogue is the other main ideal in Western journalism, objectivity being the other and to this day the dominant one. These two journalism types imply a much closer relationship between reporters and the audiences, a fracture in the traditional idea of journalism as a strictly autonomous and insulated practice. If such journalism becomes significantly more common than today, it would imply a discontinuation in the development of (Western) journalism, pointing to potentially radical changes in the values, culture and practice of journalism. 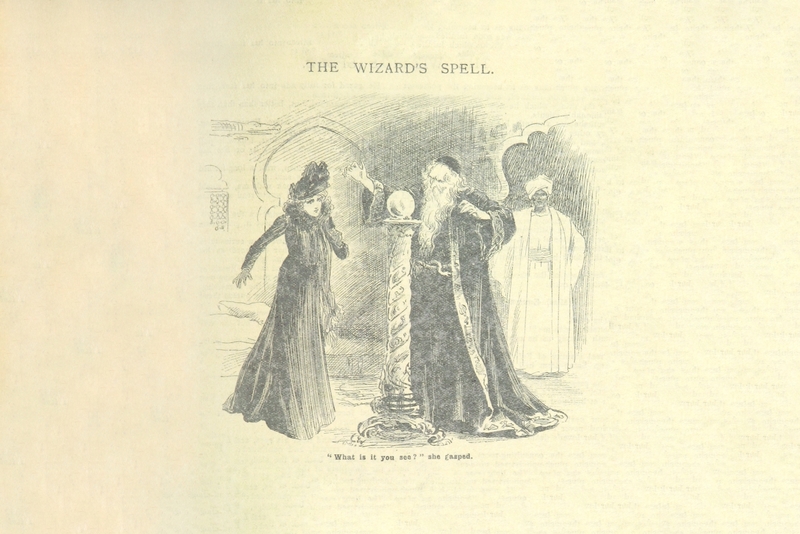 Image from Thrilling Life Stories for the Masses (1892) via the British Library. POSTED Aug. 23, 2018, 8:30 a.m.
Benton, Joshua. "Through the looking glass, backwards: What Nieman Lab’s Predictions for Journalism 2018 tell us about where we’re headed." Nieman Journalism Lab. Nieman Foundation for Journalism at Harvard, 23 Aug. 2018. Web. 18 Apr. 2019. Benton, Joshua. "Through the looking glass, backwards: What Nieman Lab’s Predictions for Journalism 2018 tell us about where we’re headed." Nieman Journalism Lab. Last modified August 23, 2018. Accessed April 18, 2019. https://www.niemanlab.org/2018/08/through-the-looking-glass-backwards-what-nieman-labs-predictions-for-journalism-2018-tell-us-about-where-were-headed/.